Whether you're looking for plain clay flower pots, or decorative terra cotta flower pots, you'll find a variety here to suit your plants. It's hard to find fault with the natural good looks of terra cotta. The earth-toned clay complements plants, making it a hands- down favorite of gardeners. Italian terra cotta pots are more decorative, often with a rolled rim or a relief design. Clay flower pots are heavy and work well to balance large or top-heavy plants. Clay is also porous, allowing air in and moisture out so the soil will dry out quickly. That's ideal for succulents that prefer drier soil. In fact, I wouldn't think of potting a cactus in anything else. 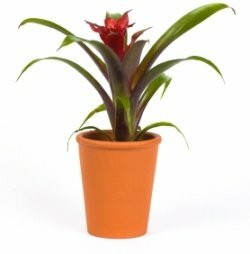 Tropical and flowering plants grown in clay pots may need watered more often than ceramic or plastic pots. Soil in glazed clay pots won't dry out as fast. You'll also discover some easy-care alternatives to terra cotta clay pots. Some are made of durable fiberglass or resin that are break-resistant and can stand up to the weather, if you choose to keep them outdoors. They cost more, but will last a lifetime. It's a good idea to use a pot with drainage holes to prevent overwatering. If you choose one without drainage holes, use it as a cachepot -- a decorative container used for covering up a plain pot. What size do you need? Terra cotta pots can be as small as 2" and as large as 24" in diameter. For repotting, choose a pot that's only 1-2" (2.5-5 cm) larger in diameter than the old one. 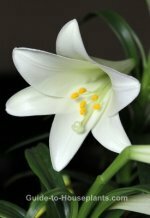 Some plants flower best when slightly pot-bound, so you may see fewer blooms by overpotting. Cacti and other succulents have shallow roots and do best in half pots (also called azalea pots ) or shallow bowls. With good care, terra cotta pots will last for several years. Want to reuse clay flower pots? You'll need to clean them first. Because clay is porous, it will absorb fungal diseases, salts and other impurities. Clean them thoroughly between plantings to avoid contaminating new plants. First, use a stiff, dry brush to get rid of leftover dried soil. Then, scrub the pot with warm, soapy water and rinse thoroughly. This handcrafted pot was inspired by European garden pottery, adding an aristocratic flair to your sunroom or patio. Magnificent indoors or out. Just right for your mini roses or other perennial favorites, these Aged Terracotta Pots (Set of 3) add a well-worn, antique look to your indoor garden or patio. Display all 3 together for a touch of Old World style. Quite a bargain for handcrafted pottery. These good-looking Glazed Clay Pots come in a set of 6 to show off your small succulents in style. They're just right for haworthia, echeveria and small cactus plants. Succulents are hot right now and it's easy to see why. Beautiful and low-maintenance...what's not to love?